One of the annual rites of passage of parenting is your child’s all important yearly birthday party. In their eyes, it is the event of the year! Many children set out to plan for at least 11 months prior to the date, and lets not even talk about how many times their plans change! Your child’s birthday party is your chance to order those unicorn headbands or ninja masks your son or daughter has been asking for and fully embrace shining the spotlight on your baby for a day. 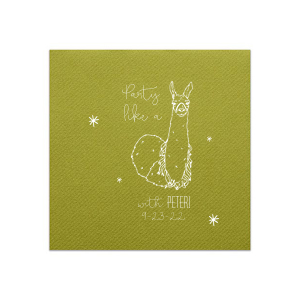 At For Your Party, we are not only here for your personalized party accessory needs, but we’re constantly curating new color palettes and themes (check out our latest animal graphic- a hand drawn llama!! ), party favor ideas and fresh takes on traditional ideas to make your birthday party planning as smooth as possible. Today we’ve compiled a short list of creative birthday party favor ideas that highlight hobbies or interests of the birthday girl or boy. Several of our party favor ideas give you the option to schedule a creative project time during the party (see also: a way to keep them busy!) to actually create what becomes the party favor, and all of the ideas have great custom packaging options. Take one of these ideas and run with it this year, and we think you’ll have a good time doing it! Is your son or daughter an artist in the making? Highlight their interest in the creative arts by hosting a party, and giving birthday party favors, that have budding artists in mind. This could be as simple as covering your dining room table with paper and setting out crayons or markers, or you can grow the theme to include a garland made of paint chips and a cake in the shape of a paint palette. For birthday party favors, package a fresh set of watercolors with a custom gift tag that sends a sweet message of thanks. Or, put together a set of mini clipboards with paper and markers or crayons attached for an on-the-go option, offered in a custom gift bag that is foil stamped with the perfect artsy design. Maybe your child is more of a sculptor, and would enjoy making homemade playdough at their party. There are lots of ways to engage the party guests in the coloring process and we’ve even seen some parents adding relaxing scents to their playdough with lavender essential oil. (We think this is an appealing idea for calming the chaos of a kid birthday party, but do your homework, as essential oils are quite potent and require supervised use.) 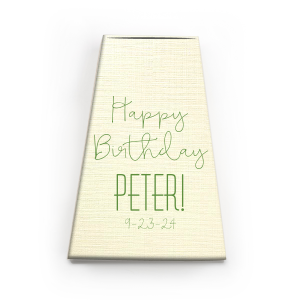 Design a custom birthday cellophane bag to send the partygoers’ goods home in style! Maybe your child is an aspiring chef or baker? If so, emphasize their interests in the party theme and, of course, the birthday party favors! A cupcake decorating station is a fun way to involve your party guests in the fun, and if you double your recipe, your guests can decorate more than one mini cupcakes, one to have at the party and some to take home in a personalized party favor box to enjoy later! With graphics ranging from unicorns to football helmets, your child’s favorites can be easily featured in your custom party accessories. Is savory food what your child prefers? A mini pizza making party is always a hit! With a simple spread of toppings and cheese, your little partiers can create the pizzas of their dreams! Personalized party favor boxes can offer an easy way to send home the leftovers so your guests can show off their masterpiece pizza pieces to their family upon returning home. For another on-theme birthday party favor, kid sized aprons are easily available online and usually quite affordable. Is your son or daughter an avid reader? 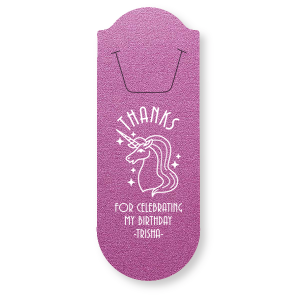 Why not feature that quality in their birthday party favor this year? Design a custom bookmark for the occasion, then host a book exchange as part of the party festivities. Party guests can bring a new or well-loved favorite book to trade, and they can slip their snazzy custom birthday party bookmarks into their books as they depart. If your child’s friends enjoy reading as much as they do, why not make a cozy reading spot, complete with throw pillows and good lighting and let them have a reading party? In warmer weather, this could also be accomplished by hanging several hammocks in the trees for them to lounge in as they read. Another party favor idea for your booklover and their guests is a party favor box filled with a treat that is known for its appearance in a favorite book. Turkish Delight, from The Lion, the Witch and the Wardrobe, or some chocolate frogs from the Harry Potter series. Of course, you could also fill a party favor box with gummy worms, as a nod to your bookworms, for a yummy treat to enjoy while reading. A booklover’s party isn’t for everyone, but we all know at least one person (child or adult) that is it *perfect* for! As you plan your child’s birthday party, remember that in a sea of characters and movie themes, you have a unique little person to celebrate! Of course, if the latest Star Wars movie is all that will make your 9 year old boy happy, go with it! It’s their party, after all. But perhaps this year’s birthday party is the one that you can feature a hobby that they enjoy or share a talent that they have in your birthday party planning. From basketball and soccer ball graphics for your sporty kid to clipart of stacks of books for your avid reader to dozens of animal graphics for your aspiring zoologist, you have great options for designing your child’s custom party accessories this year!